Since 2001, the Melee faithful have been hauling GameCubes and CRTs everywhere in order to play their favorite competitive fighter. Smash 4 fared a little better, earning a few converts and sharing the spotlight. The keyword here is “sharing,” where Melee and SSB for Wii U were often seen side-by-side in events and tournaments. Now we are faced with the question: will Melee players move on to Smash Ultimate? Will this entry in the series finally be the one that convinces everyone to take their 50 lb. TVs to the dump? Everyone is here! Each player’s main character will be available to play in Smash Ultimate, whether they want to throw some boomerangs with Young Link or rack up their own damage percent with Pichu. The stages are back. Melee players should feel right at home on Pokemon Stadium, Kongo Falls, and the beautifully updated Fountain of Dreams. Directional airdodging returns. Rather than just the quick evasions found in Brawl onward, airdodges are now considerably more strategic due to being a movement option, and having a lot of cooldown. These can no longer be spammed, just like in Melee. The fighting is faster. For elite players who still felt Smash 4 was too slow, rest assured that knockback has been sped up and damage ratios increased. Smash Ultimate will be played with 3 stocks rather than the previous game’s 2, fitting more action into the same match length. It looks better. Melee is showing its age, and the jump in graphical fidelity is huge! Smash Bros. already made the transition to HD in its previous iteration, so the developers spent their efforts on making everything more cinematic and visually appealing for the “ultimate” version. Switch is way more convenient. Smash Ultimate can be played literally anywhere: on your huge flatscreen, on the toilet, or on the plane en route to EVO. Players will be able to get more practice in, and can pack a lot lighter when attending locals and comps. You can still use GameCube controllers. Father Sakurai has blessed us once more, enabling GameCube controller compatibility with a console that is 15 years newer! Nintendo is even selling brand new controllers and adapters, so they’ll last for years to come. Customize your controls! Goodness, Melee players have been missing out on this one. Turn off tap-jump! Make the L button useful! Enter into a whole new world of optimization. They would have to relearn. Skills won’t translate across games, the meta will be entirely different, and they might not like changes made to their main characters. Ultimate will be less technical. Unless Sakurai releases a DLC pack with Melee physics, the fanbase won’t be satisfied without wavedashing. Ledge mechanics. Edge-guarding and ledge-hogging were major factors in any Melee matchup, and the trumping system found in Smash 4 and Ultimate is simply more casual. Too many match-ups. With 3 times the characters, it will be much harder to predict who you will be playing against, and counterpick accordingly. There’s still blood in their veins, breath in their lungs, and power in their GameCubes. Melee players are a resilient folk, and the scene has endured for a decade and a half. They know how to deal with new games coming out, and still keep the community alive. What do you think? Should Melee players make the switch? 5 paid DLC characters will be sold for Super Smash Bros. Ultimate, following the release of Piranha Plant (who I love) and ending by February of 2020. Nintendo has already decided who these 5 characters will be and, rudely, they neglected to consult me. Ray MK III: The main robot from Custom Robo. I’m glad to see Ray has been getting some love from the Smash Bros. team, and has appeared in various entries as a trophy, sticker, assist trophy, and (in 21 days) as a Mii Fighter costume. Sadly, the Custom Robo series is one of the most overlooked and under-appreciated Nintendo franchises. Adding him as a playable fighter would likely ignite a spark of interest in Custom Robo, just like Marth & Roy did for Fire Emblem. His moveset has unlimited potential, thanks to any number of parts and weapons the developers could pull from (that is what makes this robo custom, after all)! Shovel Knight: Big props to Yacht Club Games for getting their hero represented in Ultimate as an Assist Trophy, but an even better indie success story would be if Shovel Knight joined the front-lines of the battle. Shovel Knight may be “third party” like Snake and Sonic, but he also has close ties to Nintendo thanks to an entire line of amiibo and strong platform support. Shovel Knight would not look out of place, and has moves that can easily be mapped to the Smash fighter template by anyone with a little imagination. Waluigi: I don’t care much about this one personally, but why not! Appease the fans! This is the Ultimate entry in the franchise after all, so why wouldn’t Nintendo throw their most dedicated players a bone and get it over with? This has to be the single most requested character since Ridley, and I doubt Sakurai wants to keep hearing fans beg for Waluigi for the next decade. This will be Wario’s third game in the series, so it’s about time for his purple cohort to join the fray. Paper Mario & Paper Luigi: We already have access to two variations of Mario, so a third would seem like overkill… unless it’s an Echo Fighter duo of Paper Mario and Luigi! Mr. Game & Watch proves that flat characters work, and the Paper Mario games speak for themselves as far as moveset potential. This addition would be perfect for fans of Luigi, who don’t always want to deal with his crazy physics and janky momentum. Fortnite Dude: Just imagine it. A crossover between Super Smash Bros. and Fortnite would shake the gaming industry! There’s no other collaboration that would turn the heads of the masses. Fortnite continues to be the hottest game for the younger demographic now that Minecraft has started to plateau. I would absolutely love to see one more 3rd party addition in a Fortnite character, who would naturally have the best costume selection and taunts in the game. Attacks wouldn’t be limited to guns, but could also include pickaxe melee moves, boogie bombs that cause opponents to taunt, a glider recovery, and maybe even a little building action! Which of my picks do you agree with? More importantly, who do you want to see join the SSBU roster? Scroll down to the comments and type away! The motto is “Everyone is Here!” That’s the banner that the Smash Bros. development team has been rallying under as they seek to bring us the Ultimate crossover fighter to Switch. But you know what? That isn’t what makes Smash 5 “Ultimate” to me. This game is going to be the ultimate entry in the franchise because Sakurai and co. are finally paying attention to all the little things. Stage selection before Character selection. This is how serious players use the game, and casuals won’t even notice the difference. Save your own rule presets. Tears of joy are streaming down my face as I type this! You don’t have to change it to Stock every time! You don’t have to remember to turn Team Attack on! You can just set it and forget it. Oh bless you, Sakurai-san. Color Selectors. All characters have 8 different color schemes, and you don’t have to just cycle through them anymore, they can all be viewed at once and picked from. Quick Menu. A slide-out menu is now mapped to a shoulder button, just a press away from adjusting anything that needs adjusted and checking anything that needs to be checked! Play while you wait. When queuing up for an online match, use that time to get some practice in or knock out a few challenges. Stage hazard toggle. Smash has always shipped with a lot more stages than are worth playing on, thanks to some crazy RNG factors. Now there’s a handy switch to shut that nonsense off. It’s evident that lot of time was put into bringing many quality-of-life enhancements to Smash Bros., which will severely cut down on my frustrations with booting up the game and getting into a match. It’s the Ultimate fighter inside the arena and out in the menus. The Link amiibo needs an overhaul. 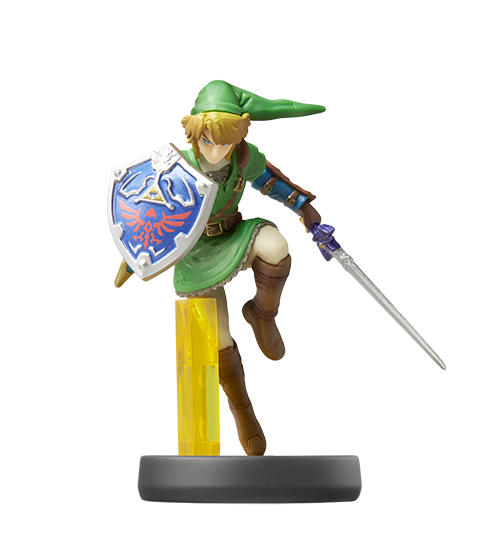 Link was released in Wave 1 on November 21st, 2014. As a Wave 1 amiibo, Nintendo had no prior experience with optimizing poses and reinforcing figurines. Look how ugly it is! I’m thankful that Sakurai and his development team are taking the time to update Link’s visuals and moveset to match the wildly popular (get the pun?) newest game, but now we are left with an amiibo/character mismatch! Sure, the same predicament applies to Zelda and Ganondorf, and I wouldn’t mind if Nintendo rectified those situations as well, but no amiibo is in greater need of help than our poor Link. I can’t fathom what they were thinking when they propped him up on a pillar of frozen urine. What can I say? I think I’m in love with a potted plant. The final Smash Direct opened with a bit of a snoozer: an Echo Fighter and a Pokemon being confirmed as the final roster additions. Sure, the fake leak didn’t help to keep our expectations down, but seriously? I would have to sit out the next 35 minutes of the Direct without another exciting character reveal? Thankfully, Piranha Plant completely blindsided me and brought that wow-factor I craved. He (she?) has a lot going for him (her?)! The only thing you could really criticize my good buddy P.P. (as I like to call him [her?]) is that it makes the Mario series even more over-represented. So what! Fire Emblem was catching up to Mario in character count, and if any franchise should have the biggest presence, it’s the plumber and his pals. I’m trying to keep my rotation of characters smaller in this game—more on that later—but I’ll undoubtedly make room for this DLC. P.S. If you call Piranha Plant “Petey” one more time, I will smack you. The Super Smash Bros. series has had a very rocky history when it comes to balancing, an important aspect of all video games, but especially ones in the fighting genre. The director of the series, Sakurai-san, has often insisted on fine-tuning each character personally. As such a critical task, he really only trusts himself (and holds himself responsible) for how the game ships. And as the cartridges or discs were produced and transported to the retailer, that’s exactly how the balance remains to this day. It wasn’t until Super Smash Bros. for 3DS & Wii U when patches were enabled. If you go back and play the first three iterations of Super Smash Bros., you won’t find balanced games. Many characters are completely inviable, and certain ones can be selected for their exploits; Ice Climbers and Meta Knight are a few prime examples. These characters were so off-balance that a handful of techniques had to be regulated by tournament organizers, and Meta Knight wasn’t allowed in many competitive Brawl events! Thankfully, Nintendo finally created an online infrastructure for their 2012 Wii U console (only a decade late, give them a break) to allow for patches. The result? One of the most balanced fighting games ever: Smash 4! What made Super Smash Bros. 4 so balanced? A huge change was made to the ledge mechanics; getting rid of ledgehogging and introducing trumping. This effectively allowed the entire roster to reliably make it back to the stage. And the aforementioned patches, which constantly tweaked stats in order to level the playing-field, ensured that no character was too overpowered. Super Smash Bros. Ultimate is increasing the character count by 28%. Is it possible that Sakurai can maintain such minute balance when adding an extra quarter of the cast? I don’t think the game will be balanced at launch. I remember fondly my Smash 4 pre-patch Sheik, who could kill with forward-air, back-air, up-air, down-B, and jab. (I’m joking about that last one.) But over the coming months, Sheik was nerfed to an appropriate level. I think you’ll see a similar pattern in the 5th Smash title; some characters will launch OP and others will be UP, but we’ll have to wait for a few tournaments to take place to discover which characters are the most abusable by professionals. Non-pros will also have an influence on the game’s balance, as the development team has already gone on record to say that Elite players’ results will be monitored! So if a certain attack is killing way too often, or a specific set-up is impossible to avoid, those things are going to get expedited into a patch. Ultimate will be the biggest Smash game yet, but also has the potential to be the most balanced. If not, I guess that’s one good reason to go back and play 4! A couple months ago, I got to go hands-on with Super Smash Bros. Ultimate! It’s faster. Due to higher damage ratios, as well as knockback that plays out faster, there’s no dilly-dallying. That appears to be why 3 stocks is the default instead of 2. Returning characters feel new. This is especially true of Link, who has been reworked from his visuals, to the bombs he throws, to his grab, to the addition of a 0% blade beam attack. It’s more animated than ever. Characters are super expressive, explosions and hits look beautiful in person and at 60fps, and even the stages come to life more than ever before. Attention to detail is off-the-charts. Sakurai is truly making this the Ultimate entry in the series, fine-tuning quality of life improvements like having stage select before characters, allowing rule presets to be created, giving a visual representation of all character colors available, and much more. There’s a lot to learn. This is no port of Smash 4, and the clearest examples of this may be air-dodging and perfect-shielding, mechanics that have been completely revamped. Gamers will need to break habits, adapt, and relearn how to play. There are still dozens and dozens of characters I can’t wait to try out. Come quickly December 7th! In Super Smash Bros. 64, there was only one tournament legal stage: Dream Land. Thankfully, in Super Smash Bros. Melee, the count rose to 5 or 6, depending on the ruleset. The community couldn’t agree on stages with Brawl, but those who tried to take the game seriously had roughly 10 stages that could be counted as tournament legal, and 31 others that were usually banned. Smash 4 brought a record-breaking 55 stages to the select-screen after DLC, but only a depressing 5 were given the thumbs-up by tournament organizers (TOs). Lots of competitions even banned the Omega versions of stages because some had walls that certain characters could cling to, or jump off! When a community limits stage selection in an attempt to keep gameplay 100% pure, the following aspects are also limited: music selection, aesthetic variety, strategy, and challenge. Those aren’t aspects of Smash Bros. I want to lose! I honestly think limiting the stage selection shortens the lifespan of a game. It can be pretty boring watching players get into a match in Smash 4: rock-paper-scissors, ban Lylat, strike a few stages, and end up at Smashville. The player who loses will switch to a character who kills off the top and take his or her opponent to Town & City, where the upper blast-zone is small. It can be very predictable. Super Smash Bros. Ultimate introduces a welcome feature: A toggle for turning off stage hazards! This will prevent terraforming stages like Pokemon Stadium from moving, shut off boss encounters and other NPC interference, and more. Now, this is a Sakurai-developed feature, so it won’t always work exactly how an eSports player would design it, and there’s already talk of ignoring the toggle and keeping the stage pool small. Some TOs are reluctant to have a bigger selection of stages available, because it makes our made-up stage striking process take longer. Forget our process! Embrace the toggle! * Let’s inject some variety into the scene and let players learn how to adapt. This will help the competitive scene take off, and thrive for years to come. *Note: The hazards-off toggle may make some stages worse, like Smashville where the floating platform doesn’t move at all and stays still in the middle. The moving platform wasn’t a problem, so I believe the toggle will NOT be appropriate for some stages, but WILL allow others into tournament rotation. Selective stage-hazards for the win. Where do you stand? Tell me in the comments. You could say that the fanbase is “mildly upset” to “PASSIONATELY AND VEHEMENTLY ENRAGED” that Waluigi has not been announced as a Super Smash Bros. Ultimate character yet. It’s great to dream about your favorite character joining the battle and I appreciate your passion, but please try to stay on topic when replying to tweets and refrain from flooding us, and other users, with requests when we’re not specifically asking for feedback. Thank you! Daddy Sakurai has spoken. So, do we need to tone it down a little bit with requesting Waluigi? Yes… and no. ✅ DO express your excitement about Nintendo, Super Smash Bros., and your favorite characters. ✅ DO talk about your character wishes with other fans and on social media. ✅ DO hold on to hope. Ridley was requested for 15 years before being added as a playable fighter. ❌ DON’T @ Nintendo employees about your wants. That crosses a bit of a boundary and really doesn’t accomplish anything. ❌ DON’T (and I know this hurts you to read) expect Waluigi soon. As evidenced by Ridley, fans CAN impact the course of a game series, but the precedent shown is that it takes over a decade. Waluigi’s groundswell of support is relatively new, and I say that as a Nintendo fandom veteran. If not this time, maybe next? ❌ DON’T let disappointment ruin your enjoyment. The Super Smash Bros. series has always offered hundreds of hours of fun, even back in the day when the roster capped out at 12 characters. One omission should not occupy your mind to the point where you cannot enjoy all 75 other characters! So, are you one of the purple mustachioed villain’s diehard supporters? Or could you not care less if he made it onto the roster? I’m curious—comment below! How many days am I going to take off work? What’s the earliest possible time I can purchase this game? Does the eShop update at the stroke of midnight? Should I drive to another timezone? Should I say goodbye to my family just in case I can’t turn the game off? Those are the kind of considerations I have to make when preparing for Super Smash Bros. Ultimate to come out on December 7th! I’ll talk more about my specific plans for launch day as it comes closer, but today I’m reflecting on my normal gaming habits, and how the release of a monumental title like Smash might affect them. Indies, hop in the back-burner. And I apologize for this one, because I love supporting independent games… Simeon and I usually take turns working through the latest eShop indie adventure during our breaks at work, but we’re absolutely going to convert that time into Smash sparring! Sure, we might look a little dorky with our screen on the table and a mess of wires draped everywhere in some crazy workaround to use GameCube controllers in tabletop mode, but who cares? And yeah, our coworkers might look up from their phones to cast disparaging looks at Simeon each time he cries out in agony when I secure victory after victory, but they’ll have to deal with it. Fortnite, it’s been great, but I’ll see you later. Fortnite captivated me with its ingenious design, compelling gameplay loop, and constant stream of content additions. It’s been the absolute best game to unwind with on a daily basis, whether I’m feeling competitive and want to go for that Victory Royale, or if I want to take it easier and knock out a few challenges. It passed up my Breath of the Wild hour-count, then doubled it(! ), firmly securing the position of my most-played Switch game. And that’s not a position that Smash Ultimate is going to allow Fortnite to keep. I’m just getting to the point of being a bit Fortnite’d out (even though I know they’re going to try and pull me back in with new weapons and modes), so I’m ready for something fresh and exciting! I want to master a few characters, climb the online ladder, and dive really deep into SSBU. Also goodbye sleep. I’ve been pretty good about not taking my Switch into the bedroom, but let’s be honest; that’s not gonna last. Not until every character and stage is unlocked, at least! Yep, Super Smash Bros. Ultimate is poised to wreck my gaming life (and perhaps a bit of my personal life too). What about you? Do you see any gaming habits changing? Leave a reply! The Super Smash Bros. series has completely mastered the hype cycle. Excitement is at an all time high for Super Smash Bros. Ultimate, which is why I’m kicking off this blog series: 30 Days to Smash Ultimate! Every day between now and December 7th when the game launches, I’ll be posting a new “Scott’s Thoughts” blog post. You’ll be able to read the whole series here. One of my favorite things to do is watch a Smash Direct, then go to YouTube and find a Nintendo store crowd reaction clip. Smash fans are packed like sardines in front of a big screen, waiting with baited breath for new announcements. As soon as a sliver of a new character appears on screen, they jump up and down, flailing their arms like their favorite sports team just won. And in a sense—they did! I’ve been at Smash tournaments where competitors and spectators alike say “these are my sports.” Whether you’re rooting for Zero to win Evo, or cheering on Nintendo as they regain ground in the console wars, every Super Smash Bros. announcement feels like a victory for your home team. Nintendo Switch owners were treated to quite the surprise in March, while watching a regular quarterly Nintendo Direct. That’s when a Splatoon 2 announcement ended and the Inklings retook center stage for the shocking reveal of Super Smash Bros. Ultimate, unveiled for the first time, and coming out in 2018 no less! Ever since, we’ve been getting drip-fed information from Sakurai and his development team, with the occasional flood of information that accompanies each character reveal! Better yet, the hype cycle doesn’t come to a screeching halt on launch day, because this Ultimate entry in the series will continue development through February of 2020! We can look forward to seeing that mysterious Smash orb logo alight into flames in many Nintendo Directs over the next 16 months. And you can bet that the Nintendo NY crowd will be there to jump up and down, and express how we are all feeling! Where is your hype meter sitting at? Let me know in the comments! Hollow Knight is a beautifully atmospheric, yet incredibly challenging platformer. It debuted on Switch a few months ago, but it’s still charming any player brave enough to pick it up. Simeon and Scott take the game for a spin and give their impressions! A new Switch console revision is rumored for 2019! Here’s our wish list AND ideas for names. Super Mario Party is out and we’re trying the brand new Mariothon mode! It’s awesome, and the rivalry is intense. There are only a few months left in the year, but all the best games are coming out in October! Scott ranks his top 5 most anticipated Nintendo Switch games for the remainder of 2018. Nintendo revealed several 2018 games, as well as made announcements for 2019! Animal Crossing? Luigi’s Mansion? Who would have made those predictions?! Scott’s not the BEST Mega Man player, but he’s not the worst either! In this video, follow along as he tackles the Block Man stage from Mega Man 11, launching October 2018. Flipping Death is a very funny game developed by Zoink and published on Nintendo Switch. It looks like a platformer or side-scrolling adventure, but you should think of it more like a point-and-click puzzle game. It’s definitely story-driven; whether you’re watching cutscenes, hearing a recap during loading screens, or experiencing characters bantering back-and-forth during gameplay, the story is always advancing and the world is being built. It starts with the sudden demise of Penny Doewood, who enters the afterlife and is promptly put on substitute reaper duty for Death himself, who wants to take a vacation to the moon. You may have already gathered that Flipping Death is quite the quirky title, and it’s very charming and entertaining as a result. The entire game is voice-acted, and skillfully so. This is a bonus that might come unexpected to the average fan of Nintendo games. The writing is top-notch, and Flipping Death’s greatest boast is its impeccable humor and timing. Simeon and I have never laughed out loud so much from a video game! You may be tempted to feel impatient as you can read the captions in half the time it takes the voice actors to deliver their lines, but the wait is worth it. Another plus in the presentation department are the graphics. Zoink chose a really unique art style, which is memorable and looks beautiful on the Switch. One thing I didn’t like as much was the music—sure it fit the game, but there were so few compositions that the soundtrack grew repetitive. Something else to watch out for are the long loading screens in Flipping Death. A narrator will meander through a funny recap of the previous chapter, which makes it bearable, but you’ll want to try to finish one of the game’s eight chapters in a single sitting so you don’t have to endure the same loading screen a second time. The gameplay is unique, in that you can gather souls as currency and spend them to possess bodies of the living, who inhabit a mirror version of the world. It’s always interesting to try out all the different characters, find out what their move is, and use them to solve puzzles or just fling them around. There’s a great variety of characters who become “playable” in this way, each with their own special twists and inner-dialogue. Sadly, controls are sub-optimal. Sometimes, Flipping Death doesn’t feel like it was made with the Switch in mind; using Death’s scythe to teleport was a good mechanic idea, but never feels quite natural as you have to use the right stick at the same time as face-buttons and trigger buttons. Some things aren’t consistent between characters (like holding a button to jump). However, It’s nice that the developers included some touch-screen functionality, which makes using the wide map easier. The Missions and challenges provide a great variety of things to do. There are also plenty of side-quests in each chapter to keep completionists busy. If you get stuck, there’s a hint system readily available which shows you what needs to happen, but not always how. It’s a good balance of negating frustration without making things too easy. Flipping Death is an appropriate length, which throws a lot of different ideas at you, but doesn’t get redundant or overstay its welcome. For a second play-through, it may be fun to come back to after several years, but hearing the jokes for the first time is the main reason to play. You could also beat the main story, then go back just to clean up sidequests which can be pretty entertaining, especially when you’re tasked with possessing an undead lama and spitting on everyone. Overall, this game really is funny. Not just during story segments either, but the way characters move, interact, and the things you can do with them. I did experience a bug that made me lose all progress while reviewing the game. Thankfully it was in chapter 1, and the devs were aware and already working on it. This game is one of a kind, and is enjoyable for the story and humor alone. Considering everything, Two Button Crew scores Flipping Death a 7.25 out of 10.